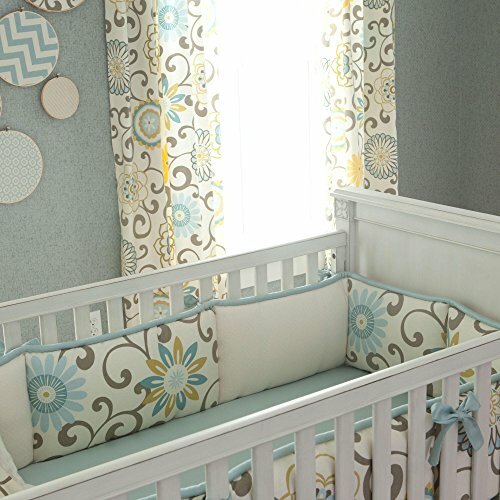 The crib bumper features Spa Pom Pon Play along the outside. The interior is comprised of Cream Matelesse on the inside with a center panel of Spa Pom Pon Play. The bumper ends feature Spa Pom Pon Play. Ties of Solid Robin's Egg Blue and piping in Solid Robin's Egg Blue add the perfect touch to this bumper. Our four-sided crib bumpers are produced in one continuous piece and fit standard cribs (using mattresses measuring approximately 28" x 52") and meet regulation standards with approximately 12" long ties and 1-2" thick batting, so that you can rest easy. Our crib bumper batting is made from recyclable hypoallergenic polyester fiberfill.